We love homemade pizza but I confess I haven’t always been one to make my own dough. I mean, let’s be honest, a lot of people don’t make their own, right? Especially if their market stocks a good pre-made one. I’ve heard some say kneading dough by hand can be therapeutic in a way. I can see that. It’s also immensely satisfying. But… know what else is satisfying? Watching the dough hook attachment on my stand mixer do all the work for me! Whichever method you choose, kneading by hand or with a dough hook, this recipe is so easy to follow and the dough comes together in a snap. Perfect for your next pizza night at home! Begin by proofing the yeast. Add yeast, brown sugar, and water to a medium size mixing bowl or stand mixer.Allow to stand 10 minutes or until yeast is producing small bubbles in the water. Add salt, olive oil, and flour. Knead by hand, or use a dough hook attachment on medium-low speed, until dough is slightly elastic and no longer sticky. Rub a medium bowl with a drizzle of olive oil to coat. Place pizza dough in the bowl, cover, and allow to rise for 1 hour, or until doubled in size. Place pizza stone in oven and preheat to 425°. Remove cover and punch down dough. Form dough into a tight ball and allow it to rest 5 minutes. 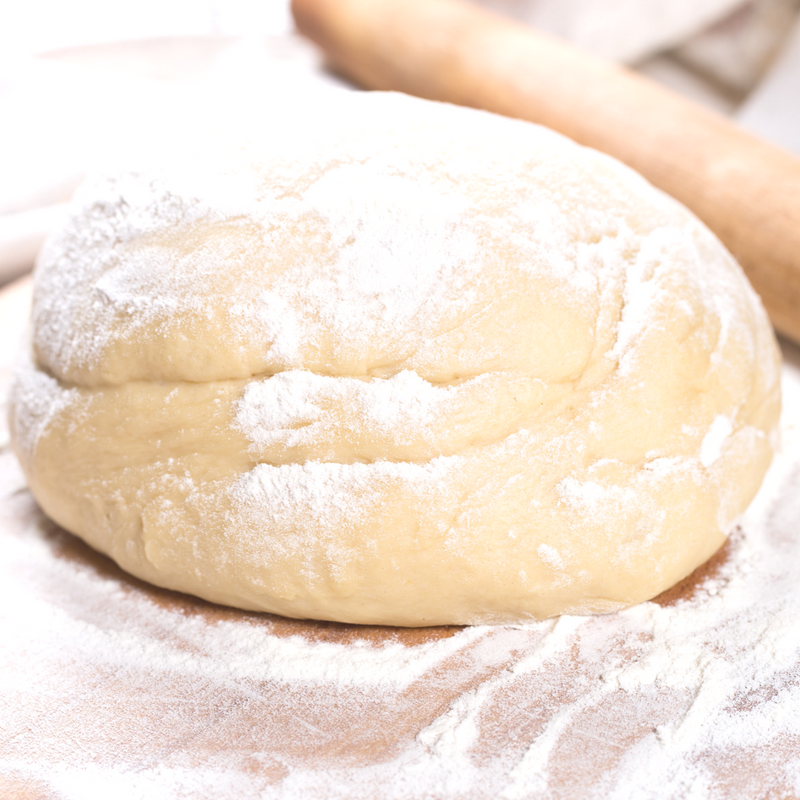 On a lightly floured surface, roll out dough into desired shape. Place on preheated pizza stone. Add your toppings and bake 15-20 minutes. Enjoy! This looks amazing! I love making homemade pizza so I definitely will be trying your recipe out! I definitely agree with the let the machine do the work part lol. But there really is nothing like homemade dough! I get a special kind of satisfaction out of watching the mixer do the heavy work! I honestly thought this was going to be super complicated, but I could totally handle this!! Definitely pinning to try with my kiddos! Right?! It’s so super easy and perfect for cooking with kids! I love making my own pizza dough. You have done a great job of taking the mystery out of dough making! I’ve always wanted to try my own pizza dough! Thanks for sharing! You’ll love it! So easy!! I love making fresh pizza dough, but I always use my bread maker. I just need to make it this way cause it sounds pretty simple! I’ve never used the hook attachment on my KitchenAid before, so this recipe will be it’s first go around! We love homemade dough and this looks delicious. I love my dough hook too! I pinned it as well because I didn’t want to lose it! Thanks for sharing! Oh man I haven’t made homemade pizza dough in ages. This inspiring me to make some this weekend. Thank you! Homemade pizza dough is the BEST! Thank you for sharing. Looks delish! I’ve never tried to make homemade dough before. It’s been a while since I started looking for a good pizza dough and I finally stumbled upon your post and found it! 🙂 Can’t wait to make a vegetarian pizza with this dough.